You know how things get toward the end of summer, when all the stuff you usually do for fun just doesn’t feel like fun anymore? Go to the beach? No, thanks. Take a walk in the woods? Don’t think so. Grab the kayaks and do some paddling? Doesn’t really float my boat today. With all the emphasis Traverse City places on its beaches, boats, boutiques and bistros, a lot of us tend to forget that this is still very much an agricultural area. 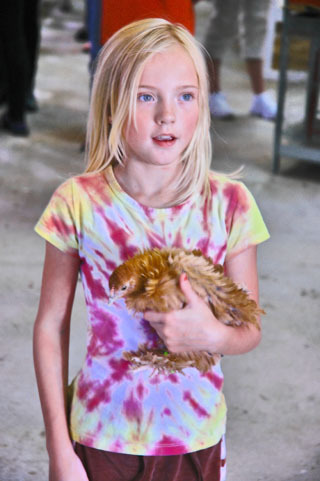 Farming and tourism loom equally large in economic importance in these parts, and they’re linked in many ways that aren’t always apparent to those of us in the sandals-and-sunscreen crowd. Beyond all the cotton candy, the midway rides and the truck races, the Northwestern Michigan Fair is very much a celebration of agriculture -- a place where farmers and farm kinds from Grand Traverse, Leelanau, Benzie, Antrim and Kalkaska counties can exhibit their products, enjoy some wholesome fun, eat some fried food and exchange useful information with each other. 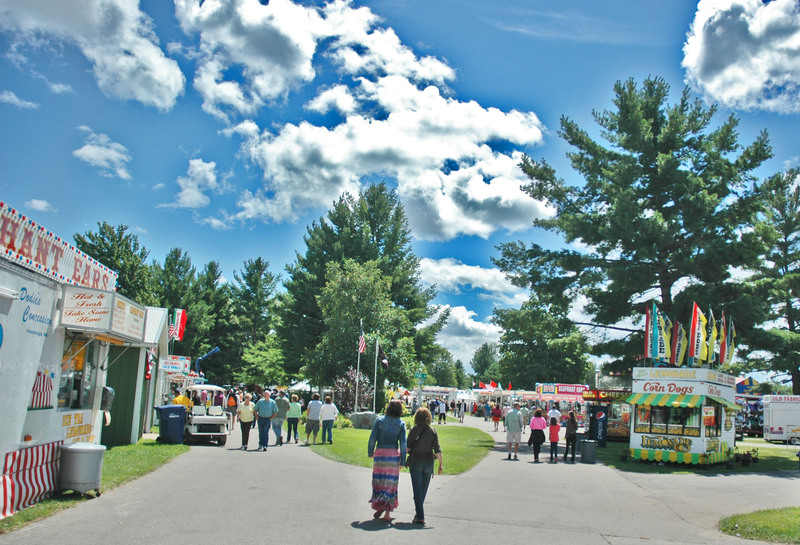 It’s been around since 1908, when the first fairs were held at what were known as the Circus Grounds (today the site of Thirlby Field) and later at what is now the Grand Traverse County Civic Center. In 1974, it moved out of town to its current location in Blair Township. As it happened, midway rides weren’t on the agenda Sunday, anyway. The theme of this year’s fair was “Boots, Hats & Denim,” and except for a single large crispy elephant ear (divided three ways) ours was a purely agricultural experience. We wandered past exhibition pens and competition arenas where horses and dogs were showing their various talents, and through a half-dozen livestock barns looking at cattle, sheep, goats, rabbits, llamas and poultry. Lots of animals! Through it all, though, what impressed me the most were the young humans we encountered everywhere we went. 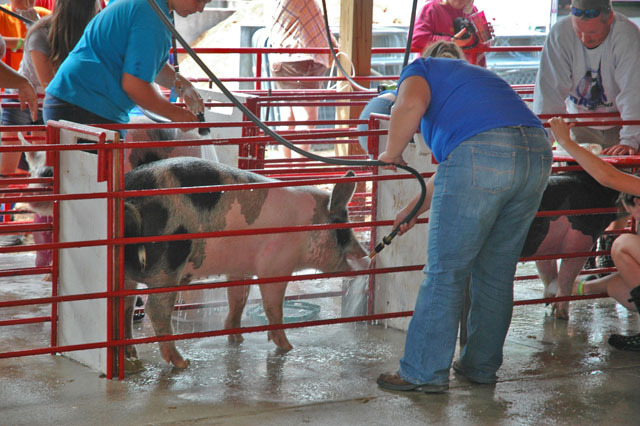 We watched patient 4H kids giving baths to some enormous pigs. (I’m still not certain whether the porkers enjoyed the experience or not, but they sure made a godawful lot of noise.) 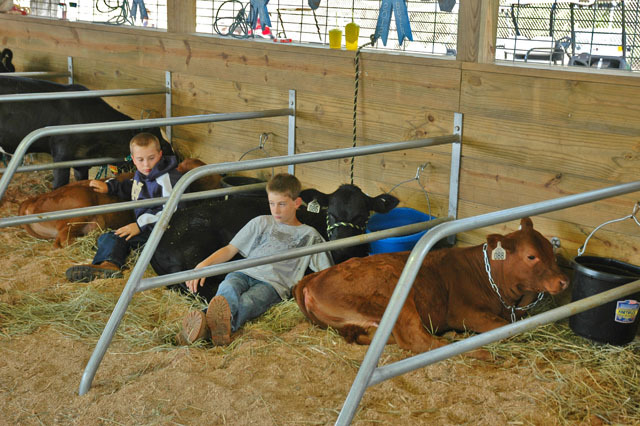 We watched kids cuddling up to the calves or steers they’d brought to the fair, stroking them and chatting with them to keep them calm in their new, unfamiliar surroundings, kids bringing their favorite hens out to show them around (“Want to pet my chicken?”) and going about a multitude of chores – dressed in wellingtons, usually, because of the ever-present danger of stepping in something smelly – that would give the fits to most kids I know. No proto-hipsters here. No postmodern irony or existential angst, and only one kid in sight wearing a porkpie hat. Don’t get me wrong – it’s not that those things don’t exist in rural America (if you need confirmation just listen to any country/western station for a half hour) but these particular youngsters, at this particular time, were just too busy setting up for Fair Week to devote much time or energy to other concerns. It was a refreshing experience, especially for jaded, angst-ridden me. 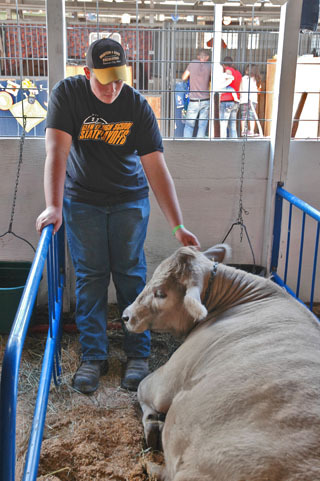 The fair lasts until late Saturday. Today is 4H Day, Wednesday is Kid’ and Special Kids’ Day, Thursday is Ag Day, Friday is Demolition Day (yeah, the evening entertainment is a massive demotion derby) and Saturday is the Grand Finale. For a schedule, check out their website http://www.northwesternmichiganfair.net/ or their Facebook page. Tickets are $3 for kids 3-12 and $5 for anybody older than that. By the way, here’s a bit of evidence that things are changing even at the fair. One of the planned events on Wednesday is something called Cooking With Kids, where a team of restaurant, school and specialty chefs will teach kids about the benefits of locally-grown foods and give them hands-on experience creating (and eating) smoothies, pasta salads and wraps.